Tom Rysinski/Pahrump Valley Times Beatty senior Jacob Henry returns for his third year as the Hornets' starting quarterback after throwing eight TD passes against one interception and rushing for 257 yards and five touchdowns as a junior. Tom Rysinski/Pahrump Valley Times Yadir Rodriguez battles for yardage during a scrimmage against Tonopah on Aug. 18 in Beatty. Rodriguez was Beatty's second-leading scorer a year ago with five touchdowns rushing and two receiving. Tom Rysinski/Pahrump Valley Times Beatty football coach Leo Verzilli talks to his players between plays of a scrimmage against Tonopah on Aug. 18 in Beatty. Tom Rysinski/Pahrump Valley Times The Beatty offense lines up before a snap against Tonopah during an Aug. 18 scimmage in Beatty. Many teams will be playing their third or even fourth game by the time the Hornets take the field. The Hornets have several reasons for optimism, starting with experience. The Hornets did not have a single senior last year, when they went 5-3 overall and 4-2 in the Class 1A Southern League. There is also some depth. Three-year starter Jacob Henry is back at quarterback. 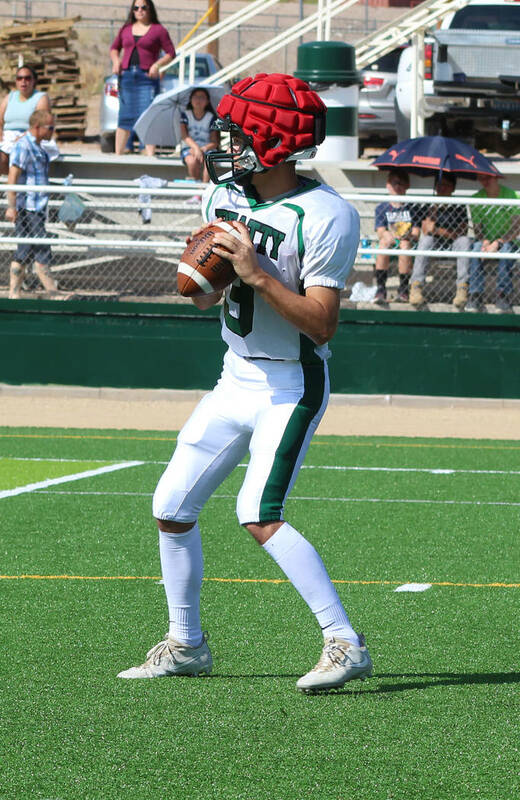 The Hornets didn’t throw much, but Henry was very efficient, completing 30 of 38 passes for 402 yards and eight touchdowns against one interception. Henry also was Beatty’s third-leading rusher, averaging almost six yards per carry while gaining 257 yards and scoring five touchdowns. 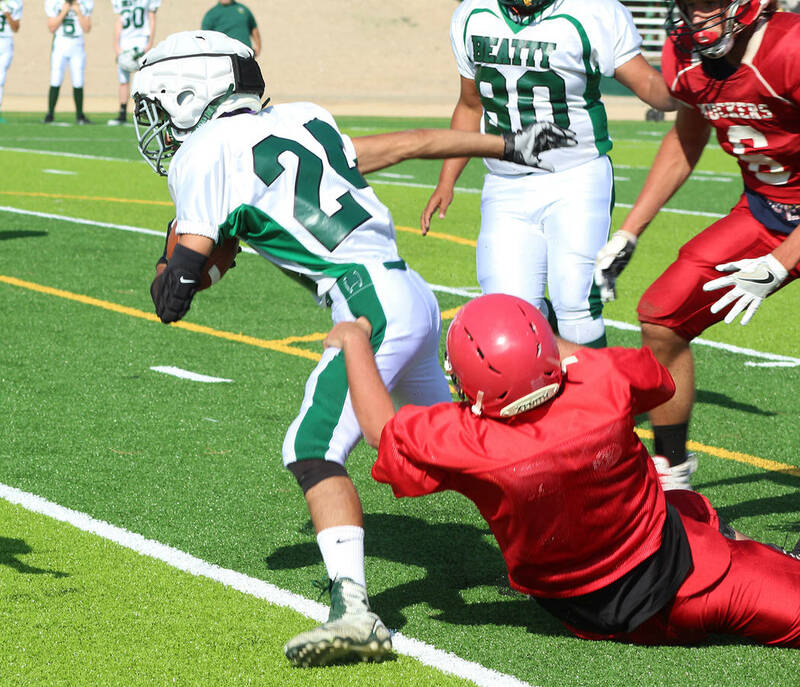 Henry has a couple of speedy backs to hand off to, as Fabian Perez led the team with 559 rushing yards and nine touchdowns while Yadir Rodriguez led the Hornets with an average of 8.36 yards per carry. “I’d pay money to watch those kids run,” Verzilli said. Opening holes for those quick backs is solid line featuring Jimmy Quirk at center, Jose Moreno at right guard, Max Taylor at right end, Juan Lopez at left guard and Gio Maldonado at left end. 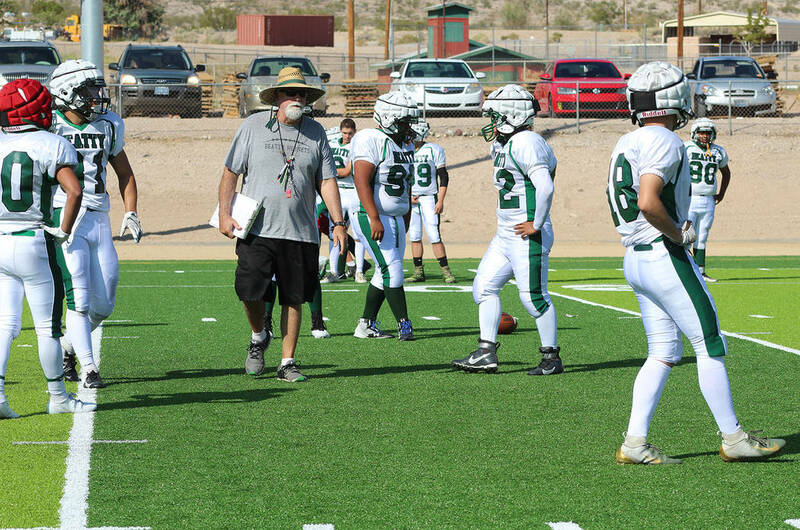 Verzilli said his team worked out the kinks that cropped up in a preseason scrimmage against Tonopah, when missed assignments made the Hornets look like a team that had just started practice which, of course, they basically had. “We’ve got that ironed out,” Verzilli said. “It’s just repetition, it’s getting those kids to talk to each other. If you know something’s going on, tell somebody quickly. Don’t keep secrets. The roster of 24 means that, while most Hornets will play both ways, Verzilli will have the flexibility to get players some rest. So an experienced, talented group of Hornets finally will play a game when the Tornadoes come to town Friday night. Trona is a quality program, off to a 2-1 start after going 10-0 in the regular season last year, outscoring opponents 579-60 before a season-ending 28-0 playoff loss to Fresno Christian. 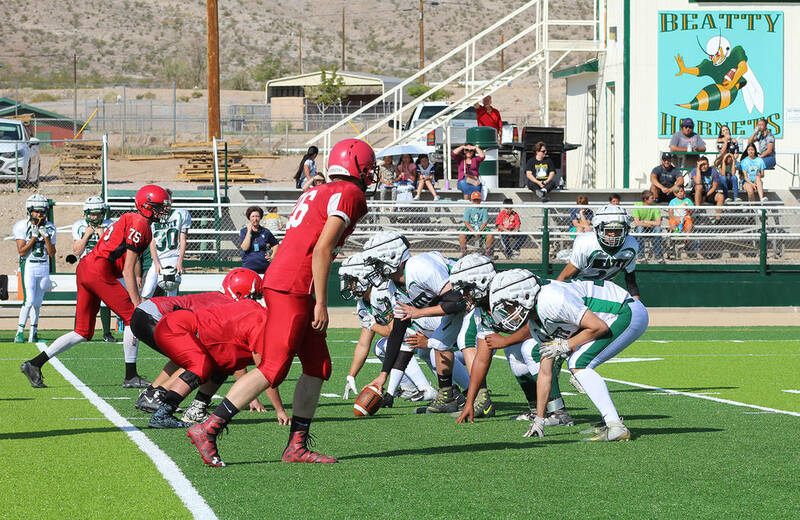 In fact, Trona has won 10 games or more in each of the past three seasons. But the Hornets are eager to get started. “These kids are ready to go,” Verzilli said. Who: Pahrump Valley (1-2, 0-0 Class 3A Sunset) vs. Boulder City (1-1, 0-0 Class 3A Sunrise). When/where: 7 p.m. today, Sept. 7, Boulder City High School. Last week: Pahrump Valley defeated Sunrise Mountain 42-41; Boulder City defeated Democracy Prep 23-8. Next week: DPahrump Valley is off, Boulder City vs. Western. Last season: Pahrump Valley 30, Boulder City 14. About the Eagles: After back-to-back 1-8 campaigns in 2015 and 2016, the Eagles played an independent schedule a year ago and went 3-6. Pahrump Valley coaches will tell you there were seasons in the past during which they thought they were undermanned but, in coach Joe Clayton’s words, they “sucked it up and dealt with it.” Suffice to say, the Trojans would love to beat Boulder City. Doing that starts with stopping Thorston Balmer. The senior 5-11, 195-pounder rushed for 130 yards and a touchdown in an opening loss to Cheyenne and 214 yards last week against Democracy Prep, including touchdown runs of 58 and 28 yards. Other than quarterback Parker Reynolds, the rest of the Eagles combined only have 11 carries in two games. Reynolds has thrown for 135 yards with one TD and one interception. Although Boulder City has played fairly well defensively, they have been victimized on special teams: Rayvion Brown of Cheyenne went 82 yards with a kickoff return for a touchdown. Turnovers also were an issue in that game, as twice during the second half the Eagles forced a turnover against the Desert Shields and promptly gave the ball right back. Coach Clayton says: “We won the last two games (against Boulder City), but up to the that point we hadn’t beaten them in a few years. Boulder City and Pahrump go way back, so they’re a team we like to beat. Let’s put it that way.